Choosing a non-toxic interior paint is wise when painting any home or office space. The average American spends ninety percent of their time indoors so the materials that surround them are important. According to the Environmental Protection Agency, indoor air may contain two to five times the pollutants of outdoor air and is considered one of the top five hazards to human health. There are a number of different ways to cut down on indoor contaminants, and choosing a non-toxic interior paint is an important part of the process. Paint only contributes to about four percent of all airborn emissions, according to the Paint Quality Institute, but choosing the right paint is an easy first step to a healthier building. There are two different kinds of paints that qualify as non-toxic paints: natural paints and low VOC paints. Natural paints are paints made from all-natural materials such as milk protein and earth pigments. Two Southwestern companies offer unique collections of natural paints or wall finishes. Do Yankee Candles Have Toxins? American Clay from Albuquerque makes a non-toxic clay plaster wall finish. The product comes in 35 basic colors that can be custom blended to match almost any paint sample. Bioshield Natural Paint, based in Santa Fe, makes paints comprised of citrus peel extracts, essential oils, seed oils, tree resin, mineral filler, tree and bee waxes, and natural pigments. Some companies, like The Real Milk Paint Company make paint using milk, lime, clay and earth pigments. Milk paints can be used on walls as well as furniture, including antiques. VOCs (volatile organic compounds) are organic chemical compounds that vaporize and enter the atmosphere. Many of the major paint manufacturers now offer at least one paint collection that is considered non-toxic due to low VOCs. For example, Sherwin Williams has a low VOC line called Duration Home Interior. Benjamin Moore has the Eco Spec collection. Low VOC paints are produced using water as the main ingredient instead of petroleum-based solvents. While some paint manufacturers may advertise their paints as having no VOCs or as being VOC-free, they actually would be more accurate to promote them as having undetected limits of VOCs. It is almost impossible to produce any material with no VOCs. In fact, if you were to review the material safety data sheets information for these no-VOC products, you would most likely see the amount of VOCs listed as negligible or undetectable. 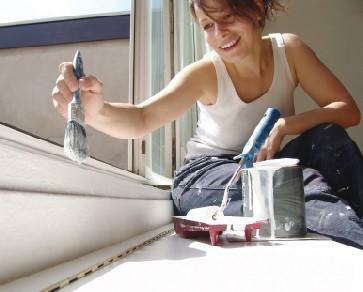 There are several third-party organizations that offer information on non-toxic interior paints and other environmentally friendly building products. The U.S. Green Build Council (USGBC) is a member-based, non-profit group that oversees the LEED (Leadership in Energy and Environmental Design) rating programs. USGBC has a LEED for Homes rating system that promotes the design and construction of high-performance green homes. Some of the benefits of a green home include less exposure to mold, mildew and other indoor toxins. LEED for Homes calls for the use of paints that pass the Green Seal certification program. Green Seal is an independent organization dedicated to setting environmental standards. Green Seal has a program specifically for testing and measuring VOCs in paints and specialty sealers. Through its programs, Green Seal encourages paint manufacturers to develop products that do minimal harm to the environment. For a list of Green Seal certified paints visit Green Seal. Green Seal requires that all interior paints are free of carcinogens, mutagens, reproductive toxins, hazardous air pollutants and ozone-depleting compounds, heavy metals such as lead and mercury, and phthalates. Green Seal also sets a limit of how many VOCs measured in grams per liter different kinds of paints can emit. Non-toxic paints have many benefits. Not only do they contribute to a cleaner, greener home and planet, but they also benefit people who suffer from allergies. They also reduce the amount of chemicals in groundwater and landfills and they limit the amount of ozone depleting contaminants in the air. Thanks to new product innovations and environmentally friendly policies from major paint manufacturers, there is no need to sacrifice quality or aesthetics when choosing a non-toxic interior paint.